Whole foods. Urban gardening. DIY. Ethical eating. Self-sufficiency. As these worthy ideals gain ground in the mainstream, interest in the micro-farm at Animal Place grows among supporters and green thumb wannabes alike. It is the visitor who comes to play in the soil as a volunteer, or to buy our farm fresh produce (someday), that gives us a new channel for the vegan message: they come for the carrots, we tell them about how they were grown with compassion. 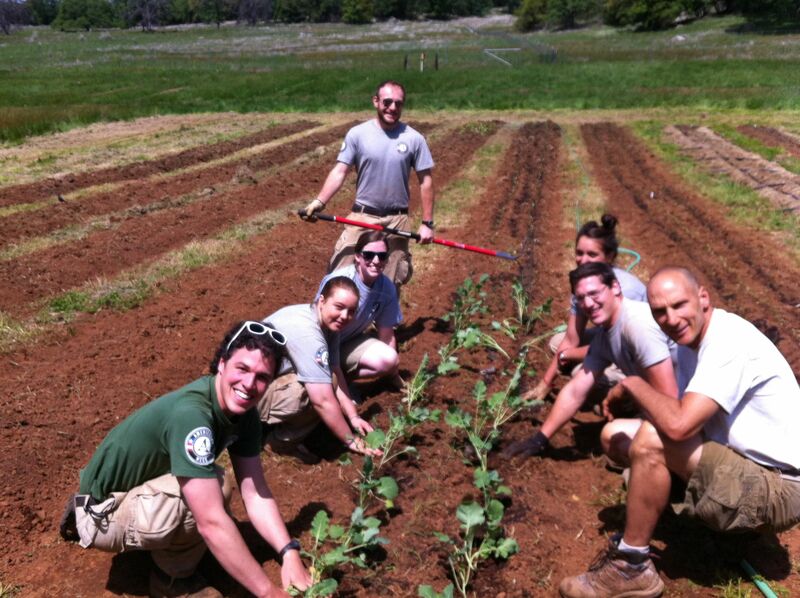 Last week, we gratefully hosted a community service project for a crew of six young women and men from Americorps. With a work-ethic honed from months of physical work in the outdoors, they buzzed around the field with hoes, rakes and wheelbarrows. After all the seedlings were transplanted and watered in, we toured the sanctuary together. They met the Turlock hens. They tickled Ivan. Fingers sunk into Aiden’s woolly coat for a scratch. Douglas got friendly and licked one of the volunteers. They asked thoughtful questions. We discussed the trifecta of why people go vegan; for their health, for the environment, and out of compassion for all beings. But what about poor people? In this group of enlistees who have committed 10 months of their lives to making positive change, one young woman from Seattle pondered aloud about the inaccessibility of veganism for disadvantaged populations. Veganism, she said, is a privilege for the middle class and above. It is easy to see how this perception could take hold in the USA, where the high quality foods at hip vegan restaurants command a decent penny. Rice, beans, and veggies may be inexpensive to cook, but the processed meat and dairy alternatives certainly cost more at the check-out than the subsidized cow. In the country where she lives and serves, she may have a point. In a study by the Economic and Social Research Institute (ESRI) that compared vegetarianism by nation, results indicated that “in countries where GDP is relatively low, people are vegetarians due to necessity”. The hungry in Africa, for example, may choose plant-based foods because it is a less costly diet. In most parts of the world, vegetarianism is the diet of choice for people with limited means. As those people become more affluent, they then choose to add meat to their diet. This diet brings negative health issues, wastes natural resources, and, in turn, contributes to the poverty of the people left behind. It is a terrible cycle. In the United States, our poor suffer more from obesity and diabetes, eating at KFC or McDonald’s because there is little choice in the “food desert” where they live. Food choices can be complex – income, education, culture, accessibility, willingness to change – and one only needs to visit the Food Empowerment Project website to learn about the myriad of injustices that punish humans, society, animals and nature every minute of every day. We could go on to further study and debate the why’s of vegetarianism here and there, for the poor and the rich, and we would learn much in doing so. Our concern for the poor may make it difficult to accept that our meat consumption in rich countries is causing more deprivation for the hungry, as we devastate their land to grow grain; we pollute their water, deforest their trees and deplete their soils to feed not them, but meat animals. Meanwhile, the poor in the US live in the aforementioned food deserts, or perhaps suffer from asthma caused by a neighboring factory farm. Are you reading this as a middle- or upper-class person, wanting to make positive change? With compassion for the poor? With compassion for animals? If any of these apply to you, you don’t have the privilege of veganism. You have the duty of veganism and for activism, and for making veganism more accessible to those in need. Please support the Food Empowerment Project in their fight for food justice for all. Please support the Animal Place micro-farm, in our quest to grow food ethically, inspire compassion and educate eaters and fellow farmers. Please support the world’s poor…go vegan!